For those of us charged with promoting our state, most of us would agree Ohio is an easy sell. The list of Ohio’s benefits for prospects are long, but there are four key assets, each with extraordinary components, that set Ohio apart from the competition: business climate, research and innovation, location and infrastructure, and workforce. 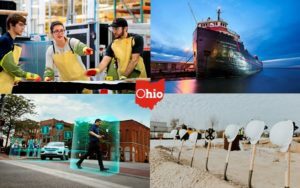 These four pillars are featured prominently on the JobsOhio home page with in-depth overviews and resources you can share with new companies considering Ohio. Ohio’s business climate could be considered the foundation of Ohio’s winning assets. As one of the largest economies in the U.S. (7th) and the world (21st), Ohio has become a great state for businesses and ultimately the global economy. In 2011, the Common Sense Initiative (CSI) was established. The CSI reformed Ohio’s regulatory policies to help make Ohio a jobs- and business-friendly state by creating a framework that is transparent and responsive to regulated businesses and makes compliance as easy as possible. Add to that Ohio’s simplified tax structure, efficient permitting process, excellent credit rating, $2 billion budget surplus and affordable cost of doing business, and it’s no wonder businesses thrive in Ohio. When meeting with prospects, it is important to highlight their future growth potential through the research and innovation happening in our state. The investments that drive economic growth and spur innovation come from a multitude of public, private and philanthropic sources. A statewide network of capital and business support creates a continuum of assistance for company creation, early-stage seed and venture funding, and corporate partnerships to scale and reach market penetration. Ohio’s roster of colleges and universities includes a number of schools with national and international reputations for research excellence. Ohio is building an infrastructure designed around a fast, cost-effective, digital and absolutely efficient future thanks to investments in transportation, digital technology and trade. This dependable infrastructure that global businesses require centers around Ohio’s advantageous location, sitting within a 600-mile radius of more than half of the U.S. and Canadian populations and close to major cities. But being close to customers and markets isn’t enough. Companies must be able to deliver their goods to those markets quickly, reliably and cost-effectively. Ohio has the air, water rail and ground transport assets to make that happen. And finally, with more than 5.7 million people in the workforce, Ohio is home to an abundant, vibrant and industrious talent pool. Ohio’s world class universities, community colleges and trade schools, workforce training programs, public private partnerships and apprenticeship strategies complement the Midwest work ethic of Ohioans. Ohio’s talent pipeline meets the demands of today and is prepared for the needs of the future.